The following remarks were given by Alan Nishio, chair of the Little Tokyo Service Center Board of Governors, at a memorial service for Fred Hoshiyama held at Centenary United Methodist Church on Dec. 18. 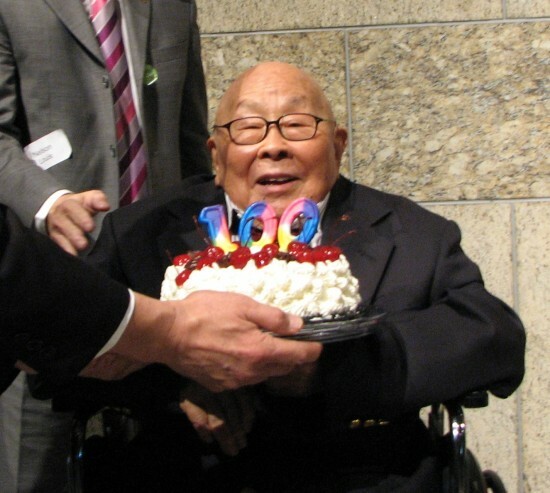 Hoshiyama passed away on Nov. 30 at the age of 100. Fred and I both joined the LTSC Board in 1984. At that time, LTSC was beginning its fourth year with a staff of three and focused on serving the needs of Japanese-speaking seniors living in Little Tokyo. Amazingly, Fred remained an active member of the LTSC Board of Directors for 27 years and retired from the board in 2011, at the age of 97. During Fred’s tenure on the board, he helped to strengthen LTSC’s philosophy of service and saw the organization grow to a staff of over 100 with programs serving not only those in Little Tokyo but people in need throughout Los Angeles. All who had a chance to know Fred found him to be certainly unique. 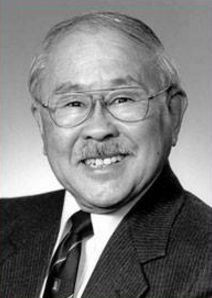 Bill Watanabe, LTSC’s founding director, fondly recalls Fred riding his motorcycle to LTSC board meetings while in his 70s! At board meetings, Fred challenged us to stretch our thinking beyond what we thought was possible in order to better serve the community. Fred could always be counted on to ask the tough questions that needed to be asked. During the latter years of his board service, Fred had failing eyesight and I recall how he would use a magnifying glass to review our financial spreadsheets and question numbers that did not make sense to him. Fred was also an active fundraiser for several community non-profit organizations. With his enthusiasm, charm, and humor, he was a natural at networking, so organizations with whom he worked benefited from his expertise and contacts. One of Fred’s last and most passionate projects was the campaign to build the Budokan of Los Angeles. Fred was very involved in the early planning of our capital campaign. Fred wanted to be present when we opened the doors to a new recreation center in Little Tokyo. We regret that we could not complete our campaign in time to meet Fred’s wishes, but we will certainly honor and recognize him at our ground-breaking that will occur next year. When Fred joined the LTSC Board in 1984, he was 70 years of age — the age that I am today. What is remarkable is that most of us in attendance today first met Fred after he had retired from his profession with the YMCA in 1980. In the second chapter of Fred’s life, he lived a life more active and fulfilling than the full lives of many of us. At an age when many of us are in or thinking of “retirement,” Fred’s life is a shining example of all that we can do to continue to make a difference in our community. Fred’s life exemplifies the experience of a generation of Japanese Americans, the Nisei. Fred was born at the Yamato Colony in Livingston, California in 1914, the beginning of World War I. This was a period of extreme racism directed toward Asians in California that was reflected in the 1913 passage of the Alien Land Law that prohibited Asian immigrants from owning land in California. Fred came into adulthood during the Great Depression of the 1930s. Getting an education, Fred’s life was then disrupted when he was incarcerated, at the age of 27, along with other Japanese Americans living on the West Coast. Despite these obstacles and hardships, Fred persevered and maintained an enthusiasm for life and a positive spirit of giving and service. He exemplified the best qualities of the Nisei generation. Fred has left us with a legacy of service to others. He was not someone with great wealth or power, but his influence on all that knew him was enormous. The best way that we can remember him is to continue his legacy of giving and service and pass it on to future generations.